• The competition, organized by the Bahía de Banderas Sport Fishing Club, promises plenty of adrenaline for lovers of sport fishing. 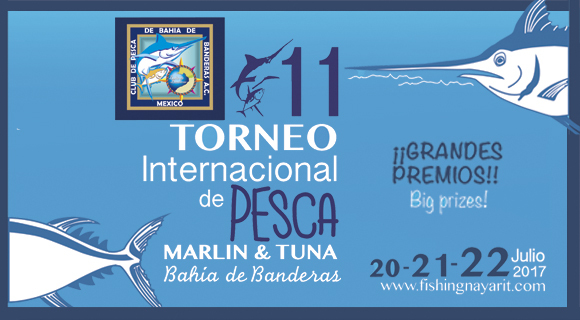 The Riviera Nayarit is preparing its rods and reels for the 11th International Marlin and Tuna Tournament in Bahía de Banderas taking place on the 20, 21 and 22 of July 2017 at the Vallarta Yacht Club, hosted by the Paradise Village Hotel in Nuevo Vallarta. The competition attracts the top fishermen in the country and abroad, called up by the Bahía de Banderas Sport Fishing Club, headed by David Zaragoza Camacho. Experts consider Mexico’s Pacific Treasure as one of the best destinations for sport fishing thanks to its more than 300 km of coastline and plentiful catches for wahoo, sailfish, mahi-mahi, tuna, marlin, roosterfish, sawfish and red snapper, among others, guaranteeing excellent fishing any time of year. It also boasts modern marinas, personnel trained to repair fiberglass hulls, luxury hotels, restaurants and the type of infrastructure required for this specific sport. Organizers have created four categories for the competition, two of which are in the title and offer the top prizes: tuna and marlin. Sailfish and mahi-mahi also have top billing. Catch and release is the modality of the day, as well as Fishing One, which refers to the marlin, tune and sailfish with the best weight on record for the tournament. There is also an award for best crew. In keeping with their standards of excellence, the Bahía de Banderas Fishing Club requires fishermen to comply with their minimum weight standards for catches and encourages them to practice ecologically correct fishing. They strive to protect the species so are only qualifying marlin weighing over 100 kg, sailfish over 25 kg, tuna over 30 kg and mahi-mahi over 10 kg. Competitors can register teams of up to four people per boat, though a lesser number of crew is acceptable. Every team must designate a captain to represent them. Enrollment and registration will take place on July 20 from 5 p.m. to 9 p.m. at the Paradise Village Yacht Club in Nuevo Vallarta. Cost of enrollment is 15 thousand pesos per boat. For more information please call (322) 225 5467 or write to info@clubdepesca.org.mx.